Does God Listen When We Pray? That’s what she told me years ago as we sat around the table in our Bible study group. She said it with a laugh, because she was a talker. She liked chatting, chatting, chatting. Listening was the sacrificial gift she gave to others. Sometimes one phrase like that sticks with you years later. It presses that impression deep into your clay-heart and you can trace your finger along the imprint over and over, to remember, to act, to transform, to put it into practice. Listening. That’s the act of love we give to others. We quiet our own renegade thoughts, stop trying to think of what we want to say next, stop tuning others out in order to turn our selfish eyes inward once again. We listen. Really listen. We listen so we can pray and ask the right questions. Yes, we listen so we can show love. I take this to heart. Me, the mom perpetually in the minivan. Some days, my kids want to babble on so. I live in a world of noise. But when I start to nod my head without hearing and insert appropriate “Mmmm—hmmmms” at well-timed pauses simply to pretend like I’m listening to them (while I secretly revel in my own private thoughts), I stop. Now I choose to listen, choose to value who they are and what they have to say. And I remind myself of this: Listening is an act of God’s love to me. He doesn’t just ask me to give this gift to others. He gives it first. I don’t always feel it, of course. Sometimes I push out those breathy prayers and feel like nothing is changing. He isn’t listening, isn’t understanding my need or even caring about my little self in my desperate situation. Those prayers sure feel at times like they are hitting that proverbial ceiling. “To you, LORD, I call; you are my Rock, do not turn a deaf ear to me. For if you remain silent, I will be like those who go down to the pit” (Psalm 28:1). “God, do not remain silent; do not turn a deaf ear, do not stand aloof, O God” (Psalm 83:1). That’s what we feel perhaps, and yet we’re assured that God hears our pure hearts when we pray. God doesn’t tune us out or ignore us. 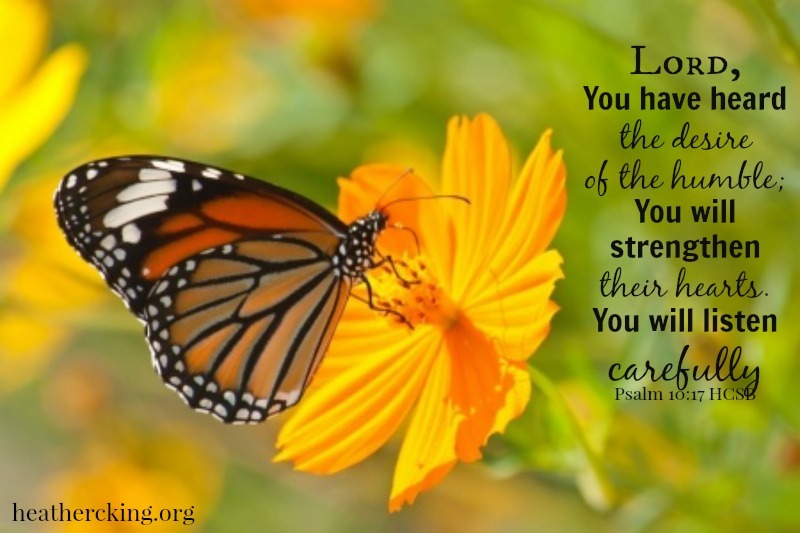 “Lord, you have heard the desire of the humble; You will strengthen their hearts. You will listen carefully” (HCSB). He listens. Not distractedly, absentmindedly, or halfheartedly. God listens “carefully” to the desire of the humble. Indeed, the Psalmist could say, “You know what I long for, Lord; you hear my every sigh” (Psalm 38:9 NLT). Even when we can’t cram our needs and feelings into words, God hears the very longings of our heart and every sigh of our overwhelmed soul. “Father, I thank You that You heard Me. I know that You always hear Me….” (John 1:1:41-42 HCSB). Jesus prayed boldly on the basis of the promise of God’s character: He is the God who always hears us. This is my prayer practice this week, the way I am pursuing the presence of Christ through my prayer life. Because God does hear us. We just need the reminder and reassurance at times. This great God, so Mighty, so Awesome, loves us and chooses to listen to us as an expression of that merciful love. Yes Heather, God hears us! Even when we might think that not! Even when we think our prayers are waste of time. He does, He listens carefully and provides for our needs. Blessings! Loved your post, encouraging for me! Would love to read that book “The beloved disciple”. It’s true….sometimes I am too half-hearted when I listen and , unfortunately, mostly with my kids. I need to grow in this!